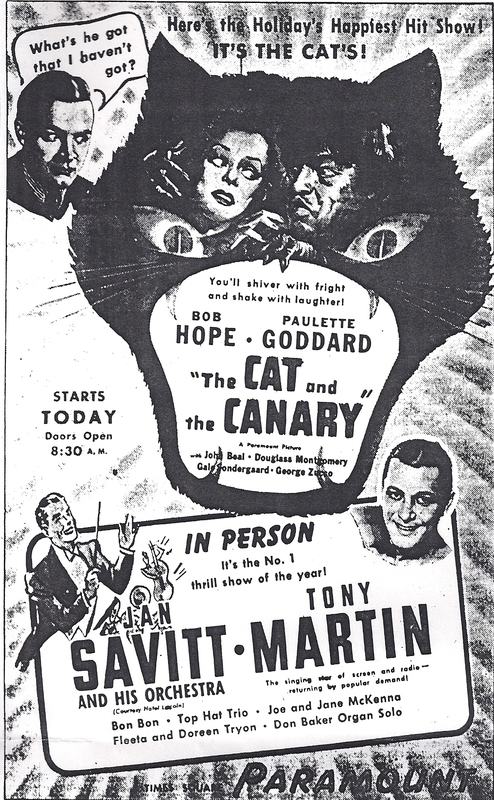 In the late 1930’s, Paramount purchased the screen rights for “The Cat and the Canary” from Universal and resurrected the story for Bob Hope turning this classic old dark house thriller into an old dark house thriller with laughs. The film which finally saw the light of day on DVD last year remains one of Hope’s best. The script was rewritten by Paramount writers Lynn Sterling (He Married His Wife, A Night at Earl Carroll’s, Moon Over Miami) and Walter DeLeon (Union Pacific, The Ghost Breakers, Pot o’ Gold)) to closely mirror Hope’s talent yet retain the thrills and chills of the original. No matter what version you look at, the plot is the same with only minor changes. Remaining family members and friends are summoned to an old dark house in the Louisiana Bayou owned by the deceased Cyrus Norman, for the reading of his will, specified to be read at midnight ten years after his death. Of course, once on the island, there is no way off until the next morning for anyone. Also on board as the housekeeper, Miss Lu (Gale Sondergaard) who would give even Mrs. Danvers a fright. She warns the guest that someone will die before the night is over. The film retains its fill of secret passageways, sliding panels, lights that mysteriously go on and off, a psycho killer on the loose and plenty of eerie atmosphere both inside and outside the house. Unlike in most of his films, Hope is a bit more restrained here, not relying purely mugging and fast humorous quips, though there are plenty of good lines. When asked if big empty houses scare him, Hope responds, “Not me, I use to be in Vaudeville.” The film is more plot driven and is filled with many nice touches of spooky thrills. Directed by Elliot Nugent who adeptly combines the fright and laughs. Paulette Goddard as Joyce Norman is both the fortunate and unfortunate inheritor of the estate. She also has a great pair of lungs on her, capably raising audible levels to new heights. Hope is Wally Campbell, a ham actor and childhood friend of Joyce who helps her solve the strange going ons and saves her life. Horror film favorite, George Zucco plays Crosby, the lawyer who will not make it through the night and Gale Sondergaard is the creepy housekeeper who assists in keeping the atmosphere sinister, also adding some comic fodder to the proceedings. Also on board are Elizabeth Patterson, who years later would become best known to baby boomers and others as Mrs. Trumbull, Little Ricky’s babysitter on “I Love Lucy” and John Beal. Look for character actor Charles Lane in a small role as a reporter. Lane would become a familiar face later on when he appeared in hundreds of TV shows, and films, including “Dennis the Menace,” “Petticoat Junction,” “Bewitched” and “Soap,” generally as a gloomy, bad-tempered, ornery, old skinflint. Hope and Goddard made two more films together, the equally as funny and spooky 1940 film, “The Ghost Breakers,” and “Nothing But the Truth”, both of which are included in the new box set from Universal. One of the joys of working with the beautiful Paulette Goddard for Bob Hope was the opportunity to meet one of his longtime idols, and Goddard’s then husband, Charlie Chaplin. As a young boy, Hope had once won a Chaplin lookalike contest. 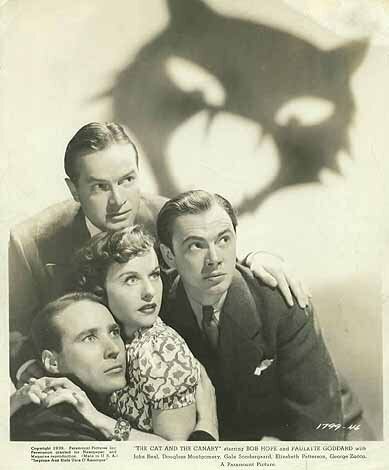 This entry was posted in 1930's, Bob Hope, Film Reviews and tagged Bob Hope, Elliot Nugent, George Zucco, Paulette Goddard, The Cat and The Canary. As usual, John, you’ve written a captivating review of a classic film. 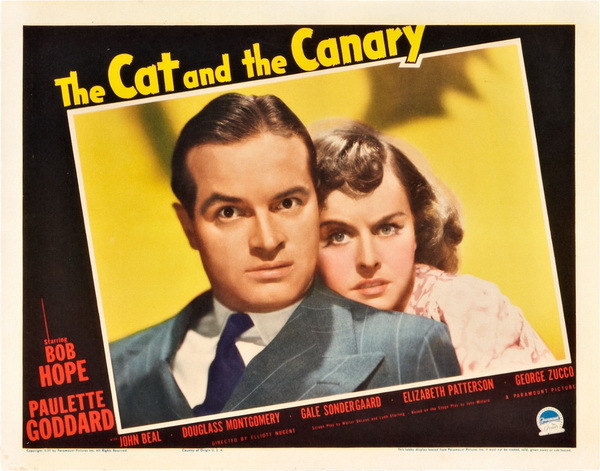 I agree this is one of Bob Hope’s best and he & Paulette Goddard make a terrific team. I prefer THE GHOST BREAKERS, which I find more consistantly funny, but they are both excellent examples of Hope at his peak. Rick – thanks and yes, THE GHOST BREAKERS is arguably the better of the two films, still this film was a major step in his career cementing him as a leading comic actor in films. Appreciate your thoughts! I especially like how you compare Sondergaard (an actress I’ll watch in anything she’s in) to the Mrs. Danvers character in Rebecca because that gag is used in Abbott & Costello’s The Time of Their Lives (Binnie Barnes gives her the once-over and cracks: “Didn’t I see you in Rebecca?”). Great review, John — I thought about doing this one but I’m glad I left it alone because you certainly did a better job. Ivan – Thanks so much. It has been a long, long time since I watched A&C’s THE TIME OF THEIR LIVES and don’t remember that but that is so cool to hear it having been used. I always thought THE CAT AND THE CANARY and THE GHOST BREAKERS would make a great double feature. Thanks for your excellent review. The Cat & The Canary seems to have been one of the most influential plays & films. No doubt its plot influenced such mysteries as Agatha Christie’s And Then There Were None. 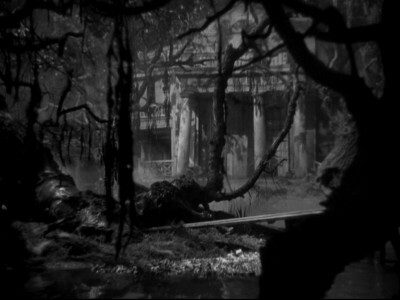 Paul Leni’s silent-film version was said to have influenced James Whale when he made The Old Dark House. It’s interesting to note that Hope became a film star not by making straight comedies but by making comedy-accented thrillers! 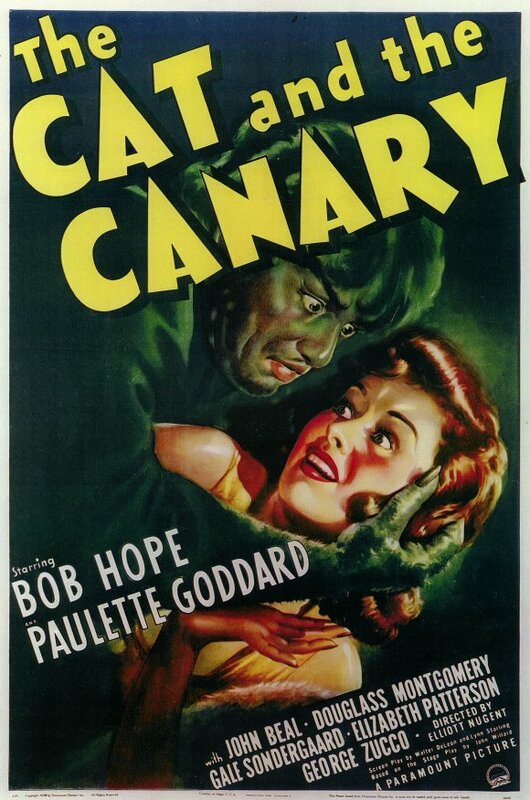 I do believe THE CAT AND THE CANARY is considered the granddaddy of the old dark house thrillers and in one form or another has been copied many times over the years. Whale’s THE OLD DARK HOUSE is a classic and a lot of fun as is Ren Clair’s version of AND THEN THERE WERE NONE. Thanks so much for sotpping by. Right on assessment of this movie, John! I was really interested in the history of it, most of which I didn’t know. I am a HUGE fan of Bob Hope and loved this movie. Like Rick, my real favorite with Hope and Goddard is The Ghost Breakers, one I watch at least a couple of times a year. Willie Best was the wonderful character actor in that one who practically carried the show. 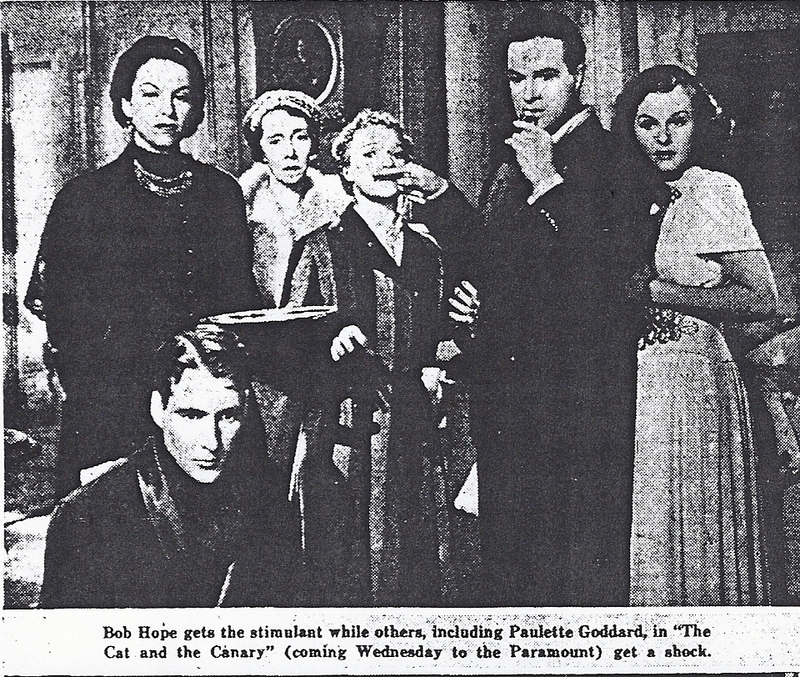 In Cat and the Canary, Gale Sondergard was that type of scene-stealer. She is creepy and beautiful at the same time! Did you know she was going to be Mrs. Danvers in Rebecca, but Hitchcock thought she was too beautiful. Thanks for a really wonderful review, John! Thanks Becky and I have been a Hope movie fan since I was a kid. As I mentioned to Rick and Ivan, THE GHOST BREAKERS does have more laughs and I would probably rate it higher than this one but not by much. Sondergard was wonderful. I may have read somewhere about Sondergard being up for the role of Mrs. Danvers, having read so many books on Hitchcock but don’t remember that. Good to be reminded. Thanks for the kind words. John, as an avid fan of comedy-thrillers in general and Bob Hope in particular, I very much enjoyed your intelligent, affectionate coverage of THE CAT AND THE CANARY! I’ve always particularly enjoyed Hope’s genre spoofs of the late 1930s through the early 1950s. Unfortunately, it’s been literally years since I’ve been able to catch up with THE CAT AND THE CANARY again, but your excellent review has me eager to pick up that new Hope DVD set from Universal; thanks for the motivation as well as your terrific blog post! Dorian – Thanks and welcome. You bring up a good point about Hope’s genre spoofs. I am particularly a big fan of MY FAVORITE BRUNETTE, THE PALEFACE and SON OF PALEFACE all of which are among his best films. The years you mention were his best from a film point of view for sure. His last decade, the 1960’s, was extremely disappointing and he was way out of touch with what was going on at the time. Was that the lookalike contest where Chaplin supposedly came third, John?! Seriously, I’m surprised to hear Bob Hope came anywhere in a Chaplin lookalike contest, as I can’t see any resemblance at all! Must admit I’ve seen very few Bob Hope films, though I’ve often seen him as a guest or presenter on TV shows – you make this film sound well worth watching, though. I thought he was pretty good in ‘Seven Little Foys’, though better in the vaudeville scenes than in the more serious parts. Judy – Hope was young at the time of the contest, not sure what age exactly but I tend to agree it is hard to imagine him as Chaplin. Wow! I have not seen THE SEVEN LITTLE FOYS since I was little myself. That is not a typical Bob Hope film, a little more serious that most for sure. If you have not seen them would check out the three I mentioned in an earlier note, MY FAVORITE BRUNETTE, THE PALEFACE and SON OF PALEFACE as more representive of the best of Hope. The two comedy-thrillers THE GHOST BREAKERS and THE CAT AND THE CANARY are up there too. All are classic Bob Hope. The background on the film was fascinating. I once had a teenage acquaintance ask for Bob Hope recommendations. She and her brother had caught “The Ghostbreakers” on television and thought he was the funniest guy ever! Funny never goes out of style. Thanks Patricia and welcome! You right, if somethings funny, it is always funny. Thanks much! I agree that Gale would give Mrs. Danvers a fright! I saw this film a few years ago late at night and I really thought with Hope in it then the title, there wasn’t a chance of getting spooked. I haven’t seen “The Ghost Breakers” but I’ll definitely keep an eye out for it. A wonderful review of a really enjoyable film. Thanks Page and yes if you get the chance, THE GHOSTBREAKERS is a must see. John, a great post that makes me want to see this movie, which I wasn’t aware of, and also “The Ghost Breakers,” which I’ve wanted to see for a while. One of my “guilty pleasures” is Abbott and Costello’s “Hold That Ghost” (1941). Realizing now that it was made 2 yrs after this film and 1 yr after “The Ghost Breakers” makes me wonder if it was intended to cash in on their popularity, since there are clear similarities. R.D. – don’t feel guilty over HOLD THAT GHOST, I love that film, one of my favorite A&C films. You bring up an interesting point about the timing of that film and the earlier Hope films. Thanks very much. I am fond of the silent version of THE CAT AND THE CANARY.As you mention the Hope film has a terrific supporting cast which adds to the joy. I hope you get to catche this film. I have not seen this film but now want to. I really enjoyed the Universal silent movie version, but this sounds like a fun movie so I’ll seek it out. This film does a great job of mixing thrills and laughs. Also check out Hope’s THE GHOST BREAKERS if you have not seen it. Thanks for stopping by! Eve – (LOL)Sondergard, Anderson and Skinner may very well be related. They all can be pretty spooky!I love comedy/thrillers/mysteries and this film along with THE GHOST BREAKERS and MY FAVORITE BRUNETTE rank up there as just pure pleasures, guilty or otherwise. Thanks for the well-written and interesting review! I’ve never heard of this film (and think early Universal films leave a gaping hole in my film watching repertoire). The plot sounds like something straight out of an Agatha Christie novel–10 Little Indians, perhaps. Kendra – Hi and welcome! Thanks for the good words. The original silent version is a wonderful visually stunning film and Hope’s version is faithful to the plot with the addition of plenty of laughs. BTW – as for Christie’s 10 LITTLE INDIANS, it may be more accurate to say that her novel is straight out of THE CAT AND THE CANARY since the play version was produced on Broadway in 1922 while Christie’s novel was first published in the UK in 1939 (a good year for more than film). The storylines are similar with the gathering of a group of people on an island and not all will make it through the night. John I have not seen this one before. I’ll have to check it out. Thanks for letting us know about it. Jon, I hope you get the chance to see and enjoy this film. Thanks for stopping by. Thanks so much for this illuminating review of a film I have never been able to see. At least, if I did see it many MANY years ago, I don’t remember it. It is rarely (if ever) anywhere to be found on tv. Glad to hear it’s now available on DVD – Finally. I am a big fan of Bob Hope’s films, most especially THE GHOSTBREAKERS which even my very modern daughter who dislikes most black and white movies, will admit is great. Ha! I wrote about THE GHOSTBREAKERS on my blog a while back and would have loved to write about THE CAT AND THE CANARY, but again, it was nowhere to be found. Hopefully I’ll get to watch it soon. Thanks again for a great review. P.S. I, too, am a BIG fan of HOLD THAT GHOST! Yvette – I am going to check out your review of THE GHOSTBREAKERS and glad to hear you daughter enjoyed it. I think they would enjoy a lot of older films if they gave them a chance, that’s what I did. Another fan of HOLD THAT GHOST..great! I always enjoy reading your posts, John–this one is no exception. Most of my exposure to Bob Hope over the years has been in the “Road” movies, the two “Palefaces,” and his work with Lucille Ball. After reading your review and the comments raving about The Ghost Breakers, I realize I’ve missed out on some great Hope films. Time to seriously catch up! Brandie – Thanks very much for the kind words. I would also check out MY FAVORITE BRUNETTE, a Bob Hope take off on film noir/detective films. Great….now I have ANOTHER film that I need to add to my “Must See” list….. Thanks Nathanael, I know the feeling. My own list keeps growing and growing. I’ve not seen this film, but I enjoyed your background description. Charles Lane AND Mrs. Trumbull?!! Must see movie. Agreed that Gale Sondergaard was right up there with Mrs. Danvers. There are some of Hollywood’s great characters actors in this film which always adds to the viewing pleasure. Awesome review to what sounds like a very atmospheric film. Good for a rainy day or on Halloween. I agree, THE CAT AND THE CANARY and THE GHOST BREAKERS would make a great rainy day double feature. Thanks for stopping by. I’m not a huge Bob Hope fan, but I AM a fan of ensemble haunted house films. This sounds like a great Halloween movie! I’ll have to remember it when October rolls around. Great review, John! Thanks Caroline and if you like Haunted House films, I think you will like this. October will be here before you know it.